The youngest of all the Abstract Expressionists, Robert Motherwell was a major force in American art for nearly fifty years and is renown to this day for his international stature as a painter, collagist, and printmaker. One of the most celebrated artists of the post-war period, Motherwell pioneered Abstract Expressionism alongside Jackson Pollock, Willem de Kooning, Mark Rothko, and Franz Kline, becoming an artist of international stature. His career encompassed more than five decades, and he received virtually every honor accorded to an artist. His work has been the subject of countless museum exhibitions and publications. 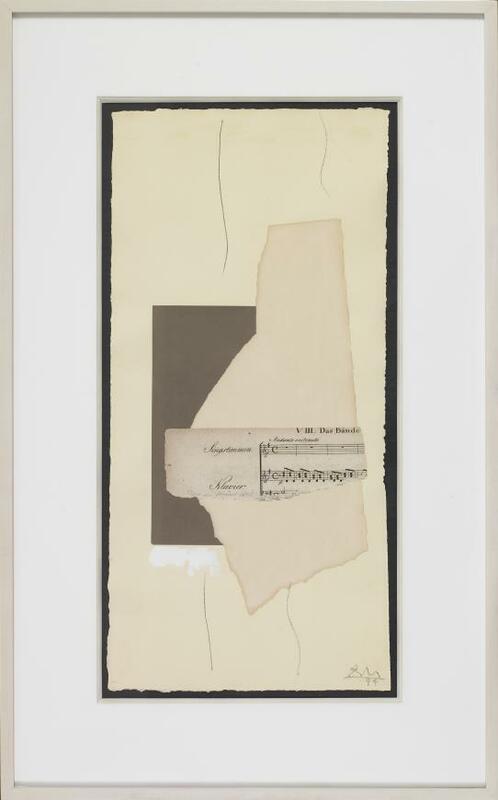 In Cabaret #4, we see Motherwell's own innovative contribution to the medium of collage: his use of a torn, rather than cut, paper edge, which maintains the gestural emphasis of Abstract Expressionism. 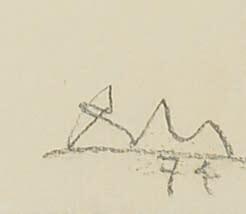 This action is echoed in blunt conte crayon strokes on the top and bottom of the sheet. By including the torn German sheet music, Motherwell bends our associations and preconceptions of artistic media, for although we cannot hear the rhythm of the piano, the bouncing notes add a lovely visual rhythm to the composition. Robert Motherwell first began experimenting with collage in 1943. Motherwell was approached by Peggy Guggenheim to produce work for the first exhibition of collages in the United States-which included works by Picasso, Braque, and other modernists-to be held at her Art of This Century gallery. Motherwell took to collage "like a duck to water," he says: "Regardless of the medium, whether it is in Eliot or Picasso or a TV thirty-second advertisement, I think collage is the twentieth century's greatest creative innovation" (Press release for Robert Motherwell: Collage, June 5 - August 28, 2013, Bernard Jacobson Gallery, London). Motherwell went on to become one of the century's most avid and accomplished collage artists. Collage first came into use as its own artistic medium thanks to the pioneering efforts of Pablo Picasso and Georges Braque. As they incorporated collage-from the French world coller, "to glue"-into their Cubist still lifes in the 1910s, the artists were able to create dynamic and textured compositions that challenged conventional art theory and notions of representation. Subsequent modern movements, such as Dadaism and Surrealism, expanded on the Cubists' use of collage beyond still life, creating radical and evocative imagery that continued to push the boundaries of modernism.